The states of Uttar Pradesh and Bihar continue to see some of the highest rates of child marriage in India. The UDAYA study takes a closer look at the cycle of disempowerment that characterizes early marriage and motherhood in the two states. It examines childbearing in adolescence; the reproductive history of married girls; neonatal and infant mortality rates for the five years preceding the interview; and unintended pregnancy experienced by married older girls. It also explores maternal and newborn care practices with respect to the first birth reported by married girls. Hardly any unmarried older boys and girls (less than 1 percent of boys and 1–2 percent of girls) preferred to get married under 18 years of age. Most adolescent girls had no say in decisions regarding their marriage and their spouse. Less than one in 10 married adolescent girls in both the states had self-selected their husband. Nearly three-fifths of married adolescent girls in Uttar Pradesh and three-fourths of them in Bihar had met their husband for the first time on their wedding day. At least nine in 10 adolescent marriages in Uttar Pradesh and Bihar were characterized by dowry transactions. Married adolescent girls had little or no control over the decision to have children, even though more than four in 10 girls preferred to delay their first birth for two years after marriage. As many as 25 percent of married girls in Bihar and 10 percent in Uttar Pradesh aged 18–19 had their first birth before age 18. 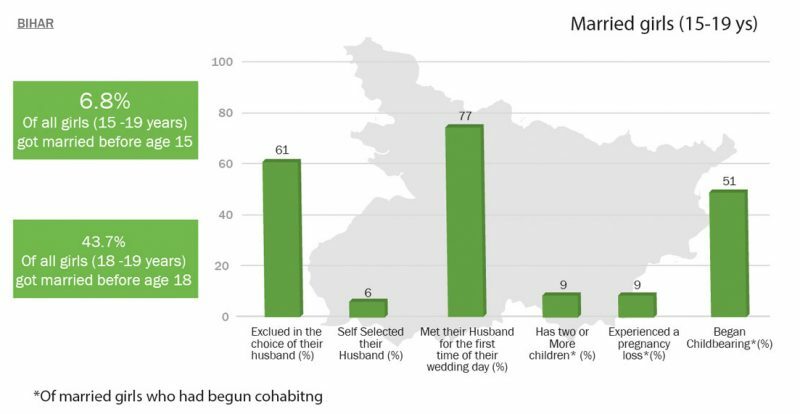 One-half of married, cohabiting girls in Bihar and a little over two-fifths of them in Uttar Pradesh had an unmet need for contraception.